The Walkers Haute Route is a 180km (110 mile) trek through the French and Swiss Alps. Starting in Chamonix, France, the route crosses over 11 high mountain passes until reaching its end in Zermatt, Switzerland, a beautiful alpine village nestled underneath the east face of the famous Matterhorn. The hike can take anywhere from ten to twelve days to complete, as backpackers enjoy traversing through striking green valleys and mountain passes. The summer season is most popular for this trip (June-September), as the rest of the year most trekkers will have to battle severe cold, snow and ice conditions. Mountain huts and refuges are available to reserve along the way, though they the fill up rather quickly so it is best to book early if you choose this option. 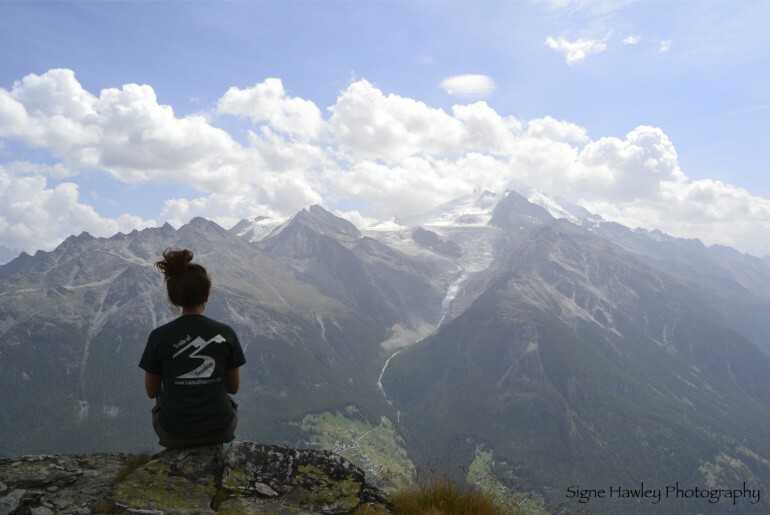 Above you will see a photo submitted by Signe Hawley, as she sits perched overlooking the beautiful glacial valley. Thank you Signe for sharing your trip with us! All photographs used in the article above were submitted by K. Signe Hawley and are property of Signe Hawley Photography.